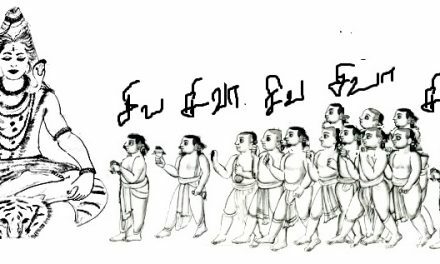 After reading my tamil article on tutelary deities there were several inquiries –both by mail and by calls seeking the ritual to be practiced to identify the tutelary deity which was unknown to them. Since I am writing what I hear from pundits in the temples as practiced by our ancestors in those days, I am again reproducing the rituals in bilingual which was reportedly practiced centuries ago by ancestors in villages to find out who the tutelary deity was when there was confusion over their tutelary deities. 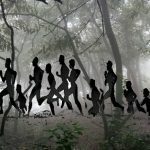 There was no system in those days to keep record of one’s practice, rituals and deities as worshiped by them except that it got percolated down by word of mouth stories in each of the families. While some of the family members kept on transferring or make available the photographic pictures of their family deities to their successors, some others remained ignorant on this issue as the facilities to make pictures were not available in those days. In such cases the worship remained based on word of mouth stories. In some families at some generation level, the worship of the family deity remained unknown or discontinued due to several reasons. Those who were eager to resume the worship of family deity began to search for their deity and thus the search process culminated into certain rituals one of which is given below. I have only published what I heard and in no way I own responsibility for its outcome or for the ritual. It is up to the individuals to believe and observe the ritual to beget benefit. In the past, when the Brahmans in rural areas did not know who their tutelary deity was observed a ritual in faith to know their deity. After taking bath in the nearby river, they would take handful quantity of clay from river bed and go home. They would make the clay like a pyramid shaped idol similar in shape the pundits make out of turmeric (as Lord Ganesha) before commencing any ritual or Pooja. Once the pyramid shaped idol was made ready they would keep it in a metal plate (brass plates) and then kept it on a wooden platform in their Pooja room. The pyramid shaped idol would be applied with turmeric or sandal paste or ash powder called veebuthi and kungumam (vermilion) and worshiped it daily as if it was their tutelary deity though the deity was unknown in appearance. 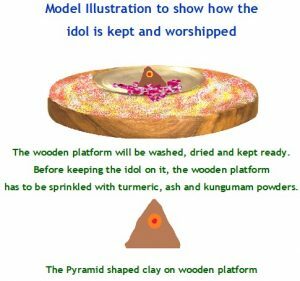 Prior to placing the clay over the wooden platform, the platform would be sprinkled with sacred ash powder called veebuthi, turmeric and kungumam and then the clay idol kept on the metal plate would be placed over it. 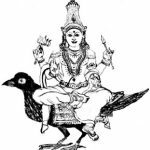 The reason why both veebuthi and kungumam (vermilion) is sprinkled on the wooden base on which the imaginary deity in clay was kept because they did not know whether their tutelary deity was male or female God or Goddess. Then they continue to worship the clay idol as if it was their tutelary deity till their actual tutelary deity appeared in their dream to reveal their identity or the inmates accidentally get the identity through some source in an act of miracle by the deity. 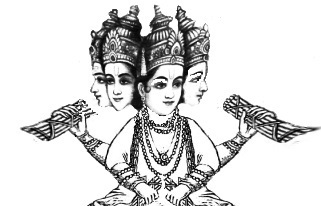 As they continued to worship the imaginary deity in clay as their tutelary deity, surely and positively at one point of time their tutelary deity appeared and revealed about their identity to them. This ritual was practiced based on absolute faith which they held in their mind and heart. Even when the process took more time, one was sure of getting the identity of their family deity by some means and continued it with faith. What they held was faith, faith and unshaken faith alone. 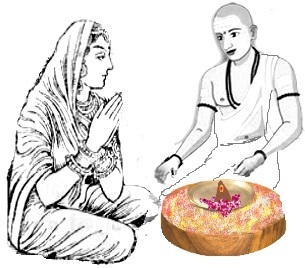 Even if they had to continue worship for long time to get the identity of the unknown tutelary deity they did not mind and continued the prayers on the fond hope that their prayers would reach the actual tutelary deity through the clay made tutelary deity based on which their prayers and wishes would be answered appropriately. Therefore, unmindful of knowing the appearance of their tutelary deity, they practiced the ritual since what was needed was to reach their prayers to their true tutelary deity so that no unwanted obstacles will come in their life or career. NO WONDER THE FAITH CAUSED THEIR LIFE TO FLOURISH ONCE THEIR PRAYERS CONTINUED THUS. 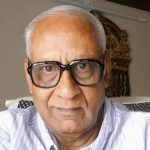 THIS WAS TOLD TO ME BY A PUNDIT IN A TEMPLE CALLED KATHIRAMANGALA VANA DURGA IN KUMBAKONAM SOMETIME IN 2010 OR 2011 WHEN I VISITED THERE. 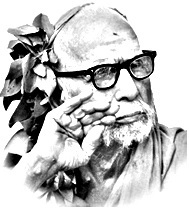 He further suggested that those who did not know the identity of their tutelary deity can alternately offer their prayers to Vanadurga Devi in Kathiramangalam who would transmit their prayers to their original tutelary deity. What are the other norms to be followed in this process? THE RITUAL HAS TO BE COMMENCED ONLY ON ANY ONE OF THE TUESDAYS AS TUESDAY IS SPECIAL DAY AND SACRED FOR WORSHIP OF BOTH MALE AND FEMALE GOD OR GODDESS. 1: – Collect handful of clay and keep it safe at home, a day before you commence the ritual. 5: – Place the metal plate with idol on it into the wooden platform. 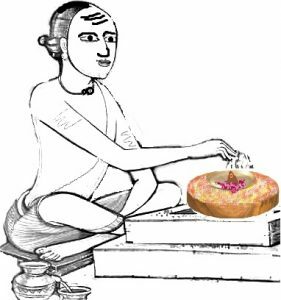 6: – Prior to keeping it on the wooden base, sprinkle Veebuthi (ash Powder), Turmeric or sandal powder and vermilion called Kungumam powder over the wooden base. 7: – Apply sandal paste and Kungumam over the idol saying that you are worshiping it as your tutelary deity, put a small garland and commence Pooja chanting some mantras if you know, otherwise don’t worry, simply say before the clay idol that “Oh God, you are our tutelary deity and you must reveal your identity and place of temple to enable me come there and offer the prayers. Till then you have to accept our prayers from here”. Chant it for three times and show camphor arthi and prostrate before it. 8: – Before commencing Pooja keep an oil lamp lighted before the idol. 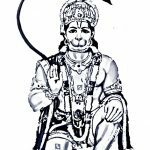 9: – Daily pray before the deity chanting the same prayer as above. Do not get confused from where the clay has to be brought. You can get it from any garden or nursery and keep it safe in the Pooja room and commence the ritual only after taking bath. Keep a Hundi for the unknown tutelary in the Pooja room for making offerings with prayers. Have absolute faith and avoid insulting or ignoring the process in midway on hearing some unwanted comments or out of frustration thinking what the pyramid shaped clay would do. 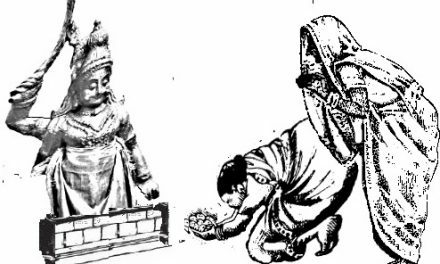 The moment you begin to practice the ritual and worship thus after installing the clay deity, your tutelary deity is sure to enter and stay in the clayed Idol. At an appropriate time, when you are destined to know, they will reveal their identity to you. Till then with absolute faith continue to treat the clay idol as if it is your own tutelary deity praying for your requirements. You will notice that your house will be filled with happiness except minor troubles one face out of karma. Do not worry even if you are unable to get the identity of the tutelary deity even when years pass. Ensure that the clay is not broken. Since the clay is sand material do not apply sandal paste and Kungumam everyday on its face as frequent handling may damage it. Once done while commencing the ritual, it is sufficient. But you can garland it with a small garland made of flowers or shower flowers over it. The metal tray in which the idol is kept can be taken out periodically and cleaned. Till you get the true identity of your deity, at the end of every year, on any Tuesday take out the collection from the hundi and deposit it in the hundi of any one of the temples nearby praying in mind that the offering put in the hundi is for your tutelary deity. Thus the ill effects accruing in view of non-prayer to your tutelary deity will vanish. IN THE MEANWHILE, IF YOU HAVE BEEN ABLE TO FIND THE IDENTITY OF YOUR TUTELARY DEITY, THEN TAKE THE CLAYED DEITY TO THE SAID TEMPLE AND DEPOSIT IT UNDER THE TREE IN THE TEMPLE PREMISES AND COME BACK AFTER OFFERING THE PRAYERS.